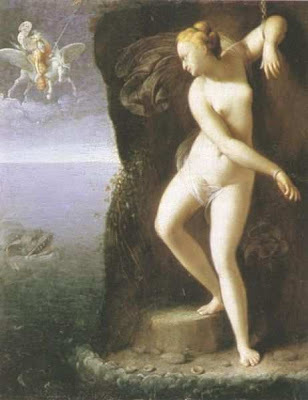 In 1610 Mozzarone painted a picture of Andromeda which is now in Florence's Uffizi Gallery. 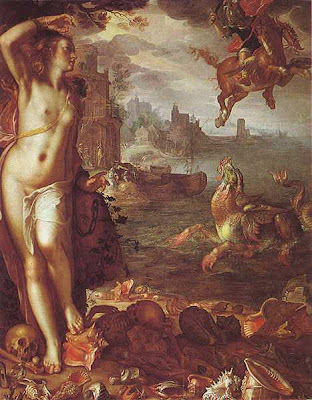 Another similar painting by Joachim Wtewael shown above, dates from 1611 and is now in Paris's Louvre. 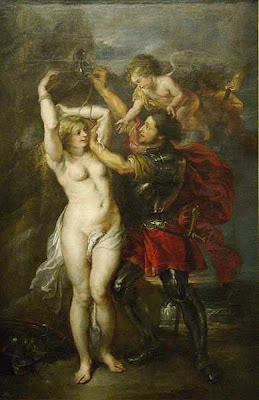 Rubens painted three versions of Perseus and Andromeda. The top picture is in St. Petersburg's State Hermitage while the middle picture is in Berlin's Gemälde Galerie Kulturforum, but not on their website. They were both painted in 1620 or 1621, while the bottom picture was one he was working on when he died in 1640 and is now in Madrid's Prado (direct link to picture not possible). 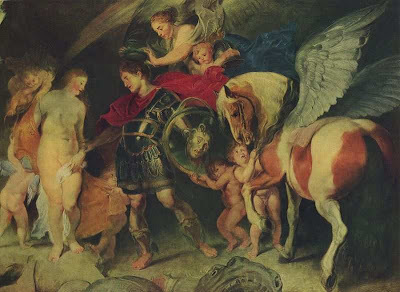 At about the same time as Rubens was painting the first two of his pictures of Perseus, Lully was composing an opera about Perseus and Andromeda: Persée, the opening of a recent TV production of which can be seen in the above embedded YouTube video. Other parts of this production are also available on YouTube. Around 1630 Rembrandt painted the above picture, which is now in the Hague's Mauritshuis (scroll down). 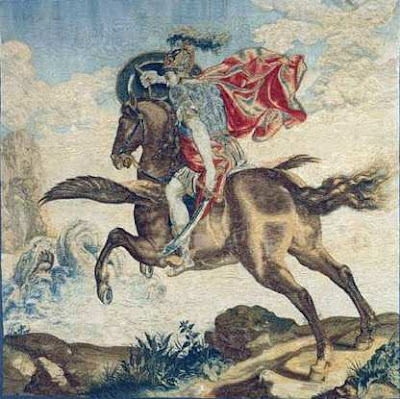 The tapestry shown above was designed by Francis Cleyn and made from 1635-1645. It is now in London's Victoria and Albert Museum, but is not on their website. 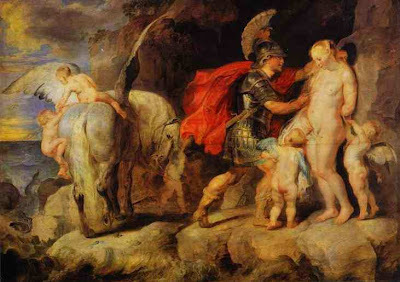 The above 1679 painting by Pierre Mignard is now in Paris's Louvre. 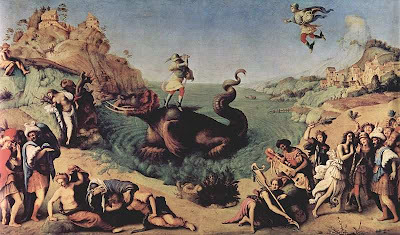 This picture was painted by Piero di Cosimo around 1513 and is now in Florence's Uffizi Gallery. Around 1524 Nicola da Urbino created a dinner service for Isabella d'Este, duchess of Mantua, decorated with scenes from the Metamorphoses. 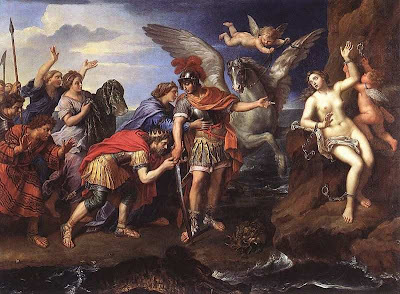 The one showing Perseus and Andromeda is now in Boston's Museum of Fine Arts. 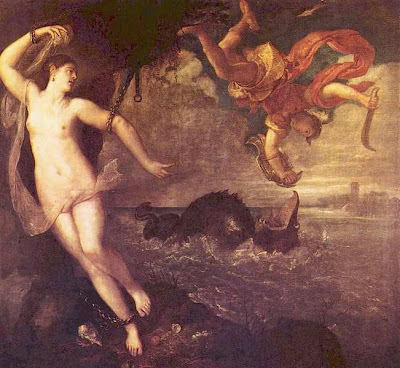 In the mid 1550s Titian painted the above picture, which is now in London's The Wallace Collection. 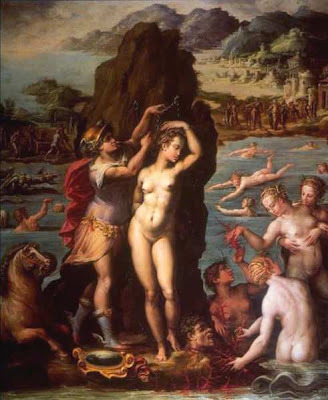 This painting from 1570 is by Vasari and is now in Florence's Palazzo Vecchio. 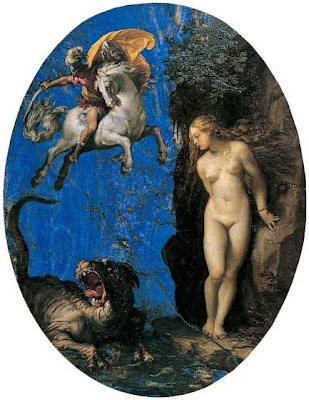 10 years later Veronese painted Perseus Rescuing Andromeda, which is now in Rennes's Musée des Beaux-Arts. 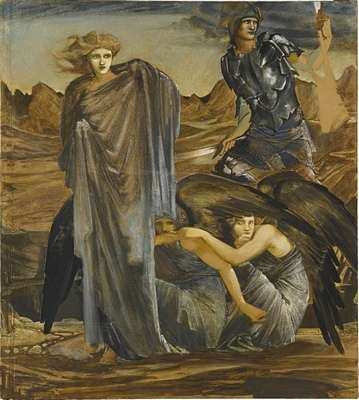 The story of Perseus and Andromeda in particular proved a prolific source of inspiration for artists, but we'll start with a wider look at the whole story as shown in a series of paintings by Sir Edward Burne-Jones. 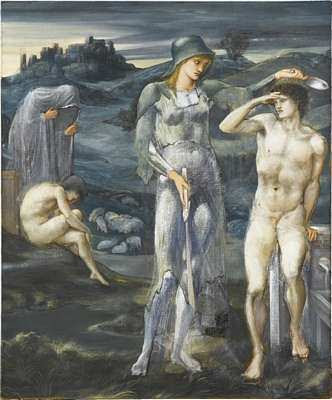 He was commissioned to produce a series of large paintings based on the story of Perseus for Arthur Balfour. 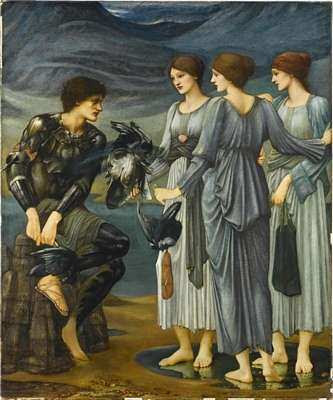 Although the series of paintings was never finished, a series of cartoons or studies for the pictures are now in the Southampton City Art Gallery. 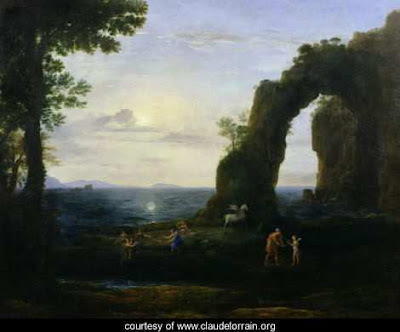 The completed paintings in the series are now in Stuttgart's Staatsgalerie, which has the pictures online, but hasn't seen fit to provide any way of linking to them. 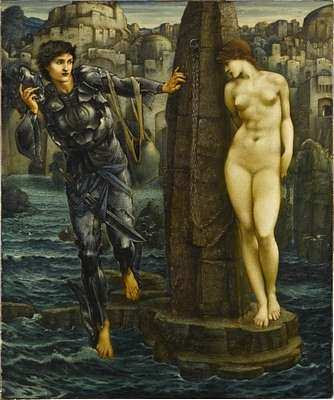 They are currently on loan to the Birmingham Museums and Art Gallery. 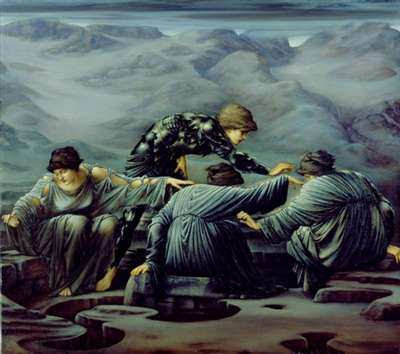 Those who intend being in Stuttgart from 24 November 2009 to 7 February 2010 might wish to go to a Burne-Jones exhibition the Staatsgalerie is planning. 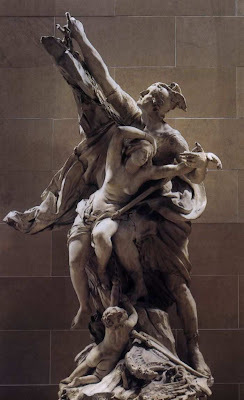 Two pictures for which studies exist in Southampton but which do not have completed versions in Stuttgart are Atlas Turned to Stone and another version of The Death of Medusa. 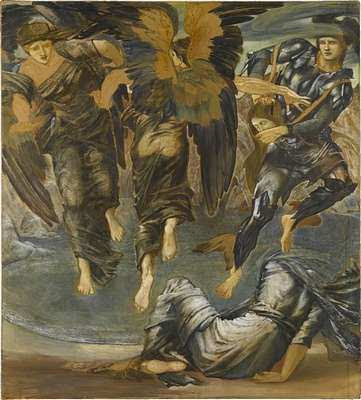 Burne-Jones's pictures were based on William Morris's The Doom of King Acrisius. 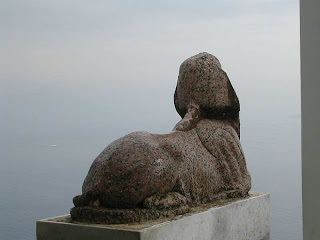 The Victorian Web has a series of pages pairing the Stuttgart pictures with the relevant parts of the poem and a series of essays and questions to ponder about the paintings (scroll down to find the index: the list may not look like links but they are). 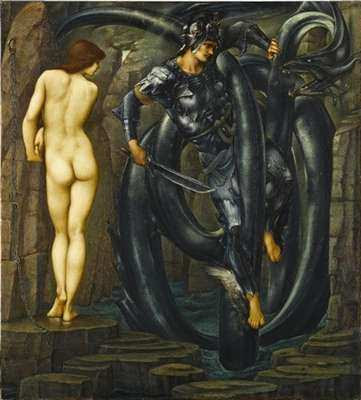 Burne-Jones combined variations on "The Rock of Doom" and "The Doom Fulfilled" in 1876 to produce a painting called "Perseus and Andromeda", which is now in Adelaide's Art Gallery of South Australia. The BBC alerts us to a legal spat between Wikimedia (the owner of Wikipedia and Wikicommons) and London's National Portrait Gallery. Wikimedia gives its arguments on its blog, but if the National Portrait Gallery is saying anything directly rather than through news media, I haven't been able to find it. No doubt intellectual property and IT lawyers are going to have a field day. But I thought I'd just explain the policy I'm following here at Matters Arising. It's probably not totally logical and consistent, but then copyright law doesn't seem to be, either, and like the rest of us is adapting to the changing possibilities brought about by changing technology. Basically, I use two main online collections for the art reproduced on this blog: Wikicommons and museumsyndicate. If a picture is not in either of those collections and the museum or gallery where I find the picture doesn't give permission to reproduce I simply provide a link. Some museums and galleries are better than others. Special kudos goes to New York's Metropolitan Museum of Art, which does allow reproduction in certain circumstances and says so clearly. Other museums and galleries may allow reproduction but wrap it up in so much legal verbiage, it really is not clear what is allowed and what is not. When in doubt I don't. BUT, some museums and galleries (mentioning no names but you know who you are) seem to go out of their way to make it difficult even to link to pictures that they are showing online. In that case, as far as I'm concerned the picture is fair game for reproduction. to two new followers: Julie Delvaux of Notebooks - Los Cuadernos de Julia and Mariana Pinheiro of Gatochy's Blog. The emperor Tiberius left Rome in 26 AD never to return. 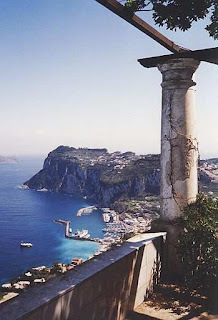 For most of the rest of his life he stayed on the island of Capri, where he had 12 villas. Remains still exist of some of them. 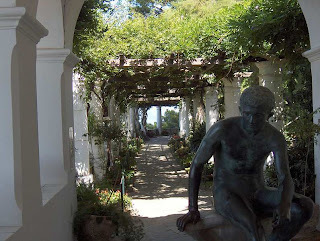 The best preserved of them is the Villa Jovis, or possibly Jonis, which was the largest. CapriWeb has four pages of text and some nice pics of the Villa Jovis, while Oebalus also has informative text and a floor plan. The University of Heidelberg's Archaeological Institute has German text with models of what the villa may have looked like. The remains of another villa at Damecuta are also covered by CapriWeb and Oebalus (again with floor plan). 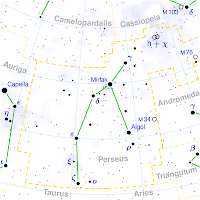 Thirdly, only Oebalus has information about the Palazzo a Mare. 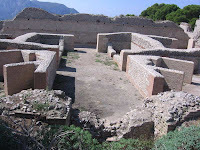 The Roman villa on the site of the Villa San Michele may have been part of this complex. Today is Matters Arising's first birthday. The first post in this blog was a year ago today. And my next post will be my 100th. and отминал прах, a Bulgarian who has the linguistic advantage of me because I can't read Cyrillic. Thanks also to David Derrick of The Toynbee Convector, Judith Weingarten of Zenobia: Empress of the East, and N. S. Gill of About Ancient History for reading along and posting their comments. A long rambling review of Munthe's book, with copious quotations. 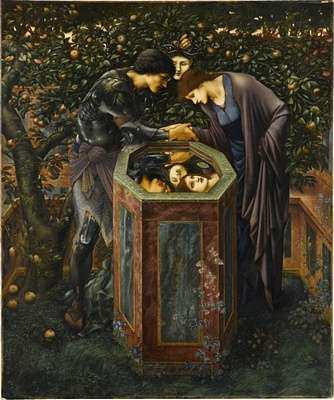 Caroline Lawrence of the Roman Mysteries blog and associated novels draws our attention to the Royal Academy's J. W. Waterhouse exhibition, running until 13th September (so no chance of my seeing it, alas). 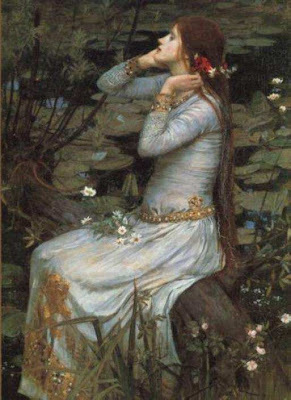 In honour of the occasion she is blogging a series of posts on Waterhouse's work.